Few + Far Between – Where Is My Teaspoon? I actually can’t believe it’s the 12th of July already and let me tell you, the panic is on! As you might have read, this month revolves around work and just trying to get settled back to life in Ireland. Honestly, moving home isn’t as easy as people make it out to be. This week I am really trying to step up my house hunt but it is going crap to say the least. It’s just so competitive out there like and all anyone is telling me is how horrible landlords are being around the place. Why can’t we just be lucky and find a house in the right area for the right price? Some people are the lucky ones, why can’t I be? To be fair, I suppose we’re not helping ourselves with some of the locations but like you have to live near enough to work so not much you can do to avoid it. I’m staying with my best friend at the minute (thank god she’s so kind) but only have a little while longer here until I need to be out. Panic Panic Panic. I’m just hoping that something good will pop up in the next few days at next week at the latest. Everything is just so uncertain at the minute but it’ll work out, always does! One good thing about not having a proper base in Dublin yet is that it gives me another reason to tip home for the weekend. It’s actually like being in college again because I have all my washing and stuff ready to go, haha! I’m sure my parents are pleased at that! 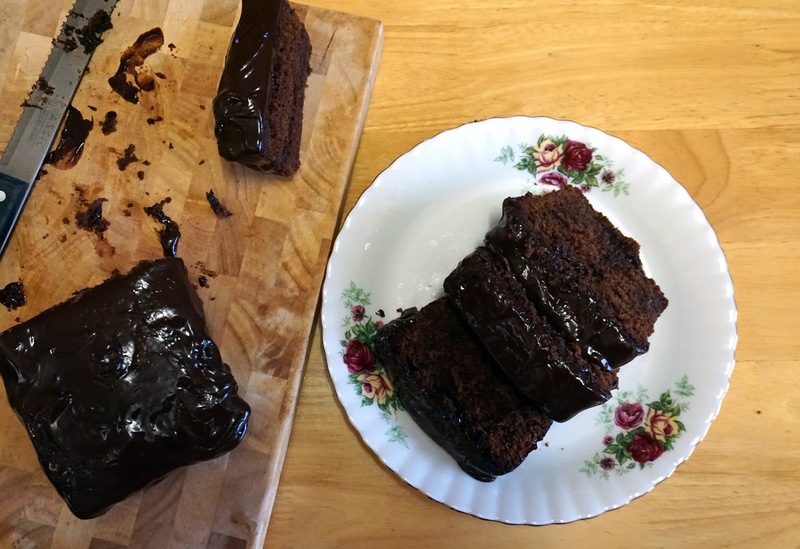 When I was home last weekend though I did manage to do a tiny bit of baking in the form of this Grown Up Chocolate Cake. I say grown up because that’s what Mary Berry calls the combination of coffee and chocolate and she is nearly always right. I say nearly because there was this one time with Carrot Cake but I won’t get into it now. I love how dark and unforgiving this cake looks, it makes no apologies for what it is: a chocolate overdose. Grab your favourite loaf tin and line it up. Preheat the oven to 180 degrees. Beat the butter and sugar until light and fluffy. Follow with the eggs, beating until nice and smooth. Sieve the baking powder, flour and cocoa together and mix into the main cake mix. Follow with the coffee essence and chocolate chips making sure everything is combined. Pour the mix into your cake tin and bake for 1 hour until risen and cooked through. Allow the cake to cool completely while you make the topping. Gently warm the cream on the hob. Add the chocolate and coffee essence and allow to melt and come together slowly. Give this a stir and allow to cool completely, it will begin to set. Once you’re ready to ice, grab a pallet knife and pop the icing on. You don’t need to be too perfect about it. I always love a cake that has icing dripping down the side. This cake is lovely with a spoon of ice-cream or cream for dessert. 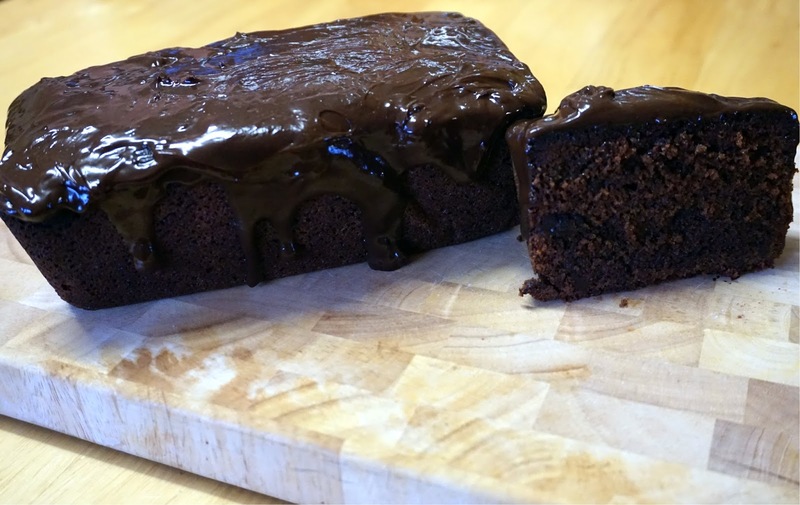 The chocolate chips throughout the cake leave it lovely and moist – sweet indulgence! I’m hoping to create some new content for Where Is My Teaspoon over the upcoming weekend so bear with me – just need everything else to fall into place first! Previous Post Work Hard. Work Harder. Next Post Bit of French Toast. Calm the nerves.